A young navy lieutenant proposes to the love of his life, only to have things go horribly wrong. This is not a full length novel. It is a short story that sets the stage for the popular Zeta Grey War Series, in particular book 1, New Recruits, and introduces some of the main characters. A young navy lieutenant proposes to the love of his life, only to have things go horribly wrong. A decades-long struggle ensues to find justice and the means to overcome hopelessly advanced alien technology. The Zeta Grey War series is a look at the covert world of secret space programs, extraterrestrial intervention in our world, the arrival of help from other human races in the galaxy, and stunningly advanced technology already present today. The methods and agenda of a predatory alien race is also explored through the research of some of our planet’s more advanced scholars and scientists. For the military, technology has progressed far beyond what we have imagined. 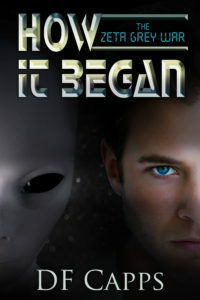 Through the characters in the series, we also discover that we are not alone through contact with two other human races, whose visionary mission is to help us transform our world beyond the control of greedy corporations and their secret conspiracy to control the government, and our progress into a higher level of technology and civilization.